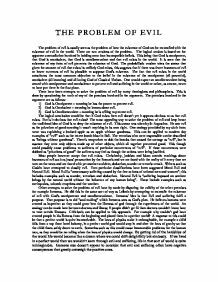 THE PROBLEM OF EVIL The problem of evil is usually seen as the problem of how the existence of God can be reconciled with the existence of evil in the world. There are two versions of the problem. The logical version is based on the apparent contradiction involved in holding onto four incompatible beliefs. This being that God is omnipotent, that God is omniscient, that God is omnibenevolent and that evil exists in the world. It is seen that the existence of any form of evil prevents the existence of God. The probabilistic version takes the stance that given the amount of evil that exists its unlikely God exists, this suggests that if there was fewer instances of evil or lower extremes of evil its plausible to suppose God's existence. The fact that evil exists in the world constitutes the most common objection to the belief in the existence of the omnipotent (all powerful), omniscient (all knowing) and all loving God of Classical Theism. One would expect an omnibenevolent being armed with omnipotence and omniscience to prevent evil and suffering in the world or rather, as creator, never to have put there in the first place. ...read more. An analogy can be made here between doctors and illness; if people didn't get ill then doctors wouldn't know how to treat certain illnesses. Criticism's can be applied to this approach. For example why couldn't god have created people in his likeness from the beginning and placed them in a perfect world? A response to this could be that a perfect world is quite inconceivable. The laws of physics make it unimaginable, for example a child falls from a top floor hotel balcony, in a perfect world god would step in and alter the laws of gravity so that the child floats safely down to earth. Scenarios such as this would cause innumerable problems for the human race, as they would be no telling when the laws of physics would change. By getting rid of the hardships of the world life would become like a dream where we could drift delightfully but aimlessly. If we lived in a perfect world then we wouldn't learn through evil and suffering, life in that sort of world is quite unimaginable. Irenaeus also doesn't appear to consider that evil and suffering often have negative consequences that greatly outweigh the positive ones. ...read more. William Paley points out that if a watch goes wrong we don't immediately say that it wasn't made for the purpose it was ascribed to. He says "irregulatities and imperfections are of little or no weight in the consideration when that consideration relates simple to the existence of a creator". He tells us to take into account the instances where "skill, power and benevolence are displayed". He is in essence in my opinion justifying the times when things go wrong and asking us to watch for the good things and don't pay as much attention to the bad things. This is all well and good but the same objection can be applied to this as the one I applied to St Augustine's argument right at the beginning, in denying evil one is denying the right to suffer and people all over the world are suffering. It shows no respect for those who are victims of evil and I believe this disputes God's omnibenevolence nonetheless. If god were a morally perfect being he would suffer alongside those victims of evil. In this essay I feel I have shown the problem of evil causes many conflicts within religious belief. Attempts to solve the problem are at best unsuccessful for example Irenaeus and at worst add fuel to the fire in the case of St Augustine. ...read more. Mackie effectively argues that Gods gift of free will is in no way an excuse for the existence of evil. God should have simply made human beings that would have never chosen to sin. Thus, ends both Irenaeus and Augustine's theodicy. Show how the theodicies of Irenaeus and Augustine account for natural evil. Phillips argued in response to Irenaus' theodicy, that it would never be justifiable to hurt someone in order to help them. It could be said that God could never be seen as good if he is allowing all this suffering in our world, regardless of any reasons God may have for this. Our aim is therefore to grow towards the likeness of God. We are transformed through free responses, and suffering is a challenge evoking such a response and development of character. can leave us on the horns of a dilemma. Consider the two conclusions below: Premise 1: God is omnibenevolent (all good). Premise 2: Goodness and evil are logical opposites. 1st conclusion: An omnipotent and omnibenevolent God exists and evil does not. 3Economics never deals with only an outcome and this is where we can see that to a certain extent, "animal instinct" plays part. In this sense, the notion does hold true. 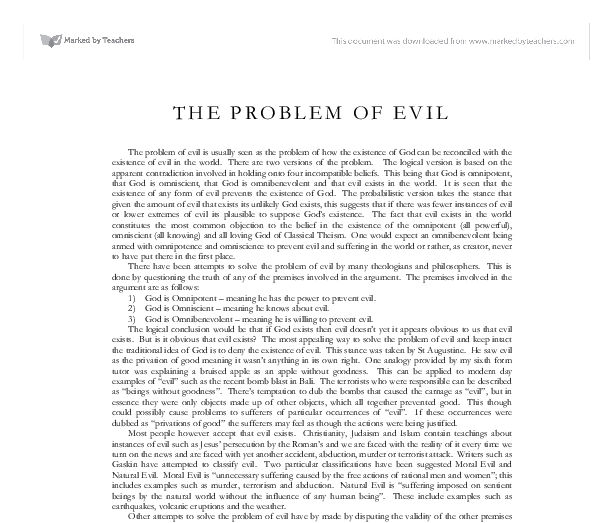 Is there a convincing solution to the problem of evil? Augustine's Theodicy St Augustine believed that God had created everything and the sinning of humans had corrupted this 'perfect world' and that evil and suffering came as a result. He uses texts from Genesis to support him with his answers as he talks about how god created us in his likeliness. Christians trust the belief that God, the creator is perfectly good, always loving and has never done anything wrong. To support this, Christians would use this quote from the Bible, "the Lord is gracious and full of compassion, slow to anger and great in mercy". would not have the means of which it would be possible for us to develop spiritually. Also, Hick argues, there exists what he calls an 'epistemic distance' between human beings and God, so that we are not born knowing of his existence, and it is not something which it is easy to gain certain knowledge of.